This book discusses the South China Sea dispute from a Chinese perspective with regards to history, law, international politics, the economy, diplomacy and military affairs. Not only does it detail China’s official position on the sovereignty and maritime disputes in the South China Sea, but also provides analyses of the related factors influencing the origin and development of these disputes. It further assesses the complexity, internationalisation and long-term struggle over the South China Sea and China’s efforts in dispute resolution. 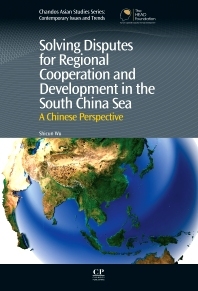 Solving Disputes for Regional Cooperation and Development aims to help readers better understand a Chinese perspective on the complexity of the South China Sea disputes, including competition over the sovereignty of the islets, islands regime and its impact on maritime delimitation, overlapping maritime claims, and how the adjacent states can cooperate for resource development in the South China Sea. This title is highly pertinent in the context of the growing attention paid to potential international conflicts in the South China Sea, and covers a wide range of topics including history, law, international politics, economy, diplomacy and military affairs. Wu Shicun is President of the National Institute for the South China Sea Studies, a sole national-level think-tank in China specializing in South China Sea studies and a wellrespected expert in the field of the South China Sea Studies. His research focuses on history and geography on the South China Sea, ocean boundary delimitation, international relations and regional security issues. He has considerable expertise and numerous publications to his credit.